Across the tube network, one stop can make a huge difference in property price. Of the 280 tube stations on the London underground network, research by eMoov shows which tube stops offer the best value where house price is concerned, as well as the largest gap in average house prices between two stops. The most notable difference is Wembley Park to Finchley Road. Although it isn’t the largest gap, the average house price in Finchley Road exceeds £1.4m. By taking the tube just eight minutes down the line to Wembley Park, you can save over £1m on your property price. On the Northern Line moving one stop from Hampstead (£1.4m) in Zone 2 to Golders Green in Zone 3, where the average house price is £962,000, can save you nearly half a million on the price of your property. Further south, moving from Turnham Green to Acton Town will save you £424,000 on the price of a London property. The average house in Turnham Green, Zone 2, will cost you £992,000. Four minutes down the District or Piccadilly line to Acton Town will cost you £568,000 – a move of one tube stop and one zone. With an average house price of £1.2m, no tube stations in Zone 1 offer a property for less than £500,000. But there are five tube stops where the average house price hasn’t yet hit the £700,000 mark. At £536,000, Aldgate East offers the ‘cheapest’ property prices across Zone 1, joined by Lambeth North, Borough, Waterloo and Vauxhall. As you head further out of inner London, the prices start to drop. 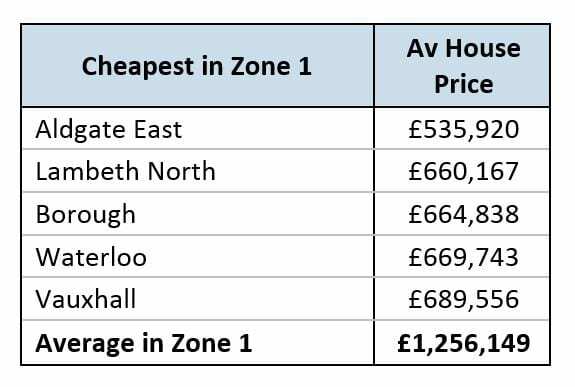 Zone 2, with an average house price of £796k is 37 per cent cheaper than Zone 1. Where property prices are concerned, the re-shuffling of the zonal boundaries has seen some new additions to Zone 2’s more affordable property market. 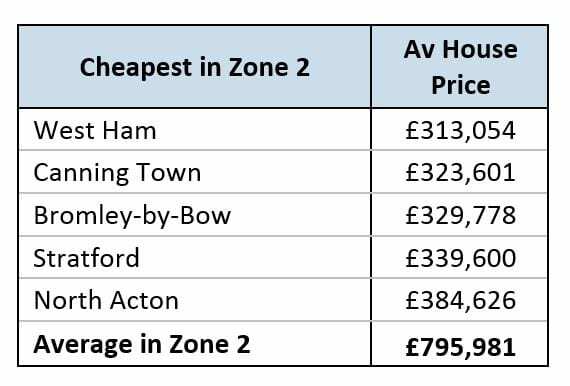 To the east, West Ham, Canning Town, and Stratford join originals Bromley-by-Bow and North Acton as the most affordable spots in Zone 2. Table of cheapest tube stops to the east, in Zone 2. East London also accounted for the majority of Zone 3’s cheapest tube stops. Zone 3 has an average house price of £595,000 and East Ham is the most affordable at £274,000. 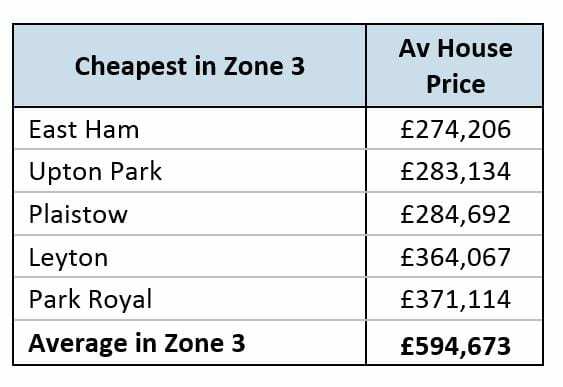 Park Royal, with an average house price of £371k is the cheapest stop in Zone 2 to the west of the capital. 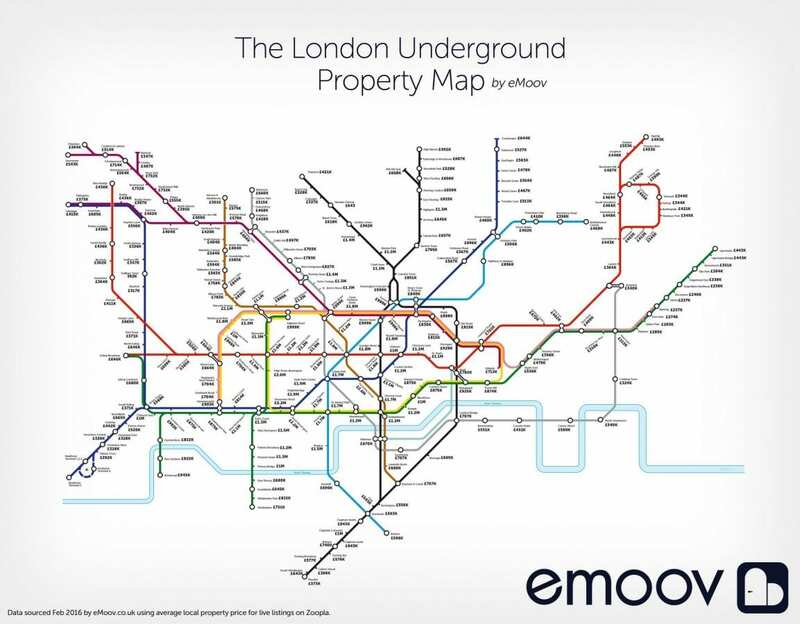 Russell Quirk, founder and ceo of eMoov.co.uk, commented: “The tube map is a fascinating way of breaking down the London landscape, especially where property price is concerned. “Despite the constant threat of strike action, a property close to a tube stop, on a good line, remains one of the most sought after pieces of property in the capital. Close proximity to a tube stop will always act as an additional selling point for sellers and in most cases, is justification for a higher asking price. For those looking to maximise their property potential on the London Underground, the most affordable property prices across the whole network are found in Zones 4 and 5. The cheapest all lie within a nine-minute tube journey of each other in the London Borough of Barking and Dagenham. Barking, Dagenham East and Becontree all have an average house price ranging from £237,000 – £240,000. What Effect will Brexit have on London House Prices? Map needs to be expandable, cannot read it!